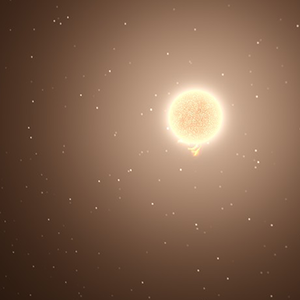 A red dwarf flare star far out in the frontier. There are four planets orbiting it, not including its sub-stellar companion, Erebus. 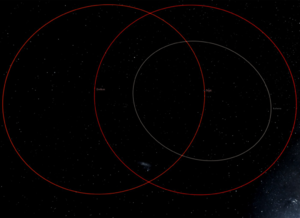 Massing at only 58% of Sol's mass with 69% of Sol's radius, Nyx has a much closer "Goldilocks" zone than Sol. 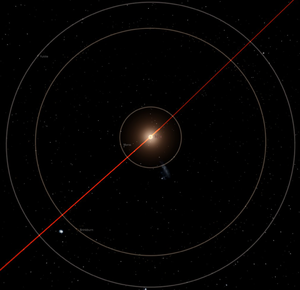 Nyx is known to have an unusually low equatorial velocity of about 1.2km/s. 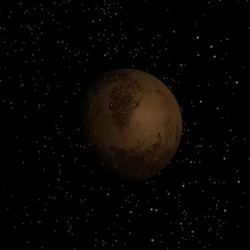 A mercurial planet, Moros is tidally locked to Nyx with a dayside surface temperature of 980K. Several geological surveys have been performed on the night side, revealing it to be a relatively normal ball of rock. It is undergoing a slow orbital decay under the influence of Erebus, and is expected to be broken apart by tidal forces within the next 50 million years. A martian planet, Brinkburn is small and dry, yet is hot enough to be habitable and supports a slowly growing population of nearly 38'000, some 98% of whom are human. It is encircled by a dense ring system, theorized to be the debris of a broken primordial moon, which makes it relatively unsafe to enter or exit orbit - although the rings are heavily trafficked and prospected regardless. The Void Star No one quite knows who built the Void Star, or indeed who actually manages the place. Theories abound, ranging from corrupt corporate interests to organized crime; some more outlandish offerings even claiming the place has always been, like some kind of haunt. The Void Star is commonly described as a casino and best known as a pleasure station, orbiting furtively at the edge of Brinkburn's rings with a protective entourage of hired small craft and sprinkled inside and out with garish neon signs, loud music from a dozen different worlds and, if you're willing to dig deep enough, anything you could possibly think to spend Thaler on (and a great many things you couldn't). Some - brave, mad, or both, but all with money to burn - even call it home. 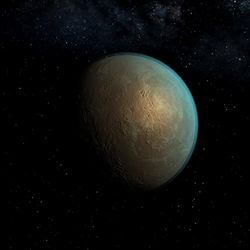 A superearth near the outer edge of the habitable zone with a slowly outward-trending orbit, Yulcite sports a surface gravity of 1.3G and a balmy average day temperature of -11C. It has been a hotbed of xenoarcheology for decades, following the discovery of the remains of a pre-space native civilization, now over 8.3 million years dead. Emerald Habitation A relatively sub-par housing station with a significant non-human population. The facility is a jumbled set of mixed commercial and crowded residential modules, each with their own unique environmental systems quirks that make traveling within the station an adventure in fragrances. Despite its reputation Emerald Habitation is well trafficked, as its prices allow lower income spacers the means to find their feet in Nyx; or at least a berth headed elsewhere. 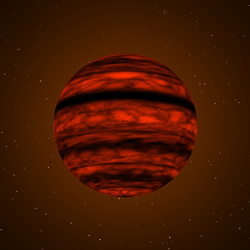 Regarded for decades as an uninteresting substellar companion to Nyx and massing nearly 50 Jupiters, Erebus is a T-Class brown dwarf with a surface temperature of 965K, orbiting almost 40 AU from Nyx in a near-circle that takes more than 315 years to complete. 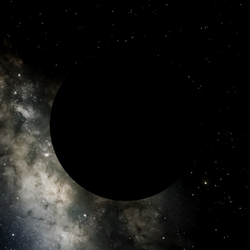 The presence of phoron in and around Erebus has driven much of the activity of the first half of the 26th century in the Nyx system. With over 80 moons over 5km in diameter and hundreds smaller, Erebus is a hub of mining and corporate power plays. 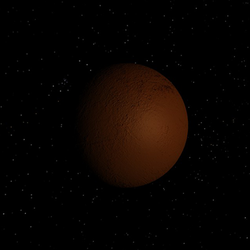 Erebus' most notable moon, although not its largest, is Roanake, a dwarf planet in its own right which orbits with a high enough eccentricity to have significant volcanic activity due to tidal heating. Despite these inhospitable conditions, it plays host to a small and lucrative (if cramped and uncomfortable) sub-surface rare earth mining settlement with a population of several hundred. The main hub for Nanotrasen in the Nyx system, commonly referred by their workers as central command or "CentCom". The Crescent refines and stores much of the products that stations (such as the Exodus) bring in. It is one of the largest refueling and supply stations in the system, as Nanotrasen is able to outsell any local competitors. A highly profitable Nanotrasen research and prospecting installation, primarily focused on the exploitation of phoron. In recent years, the Exodus has been under threat from opportunistic raiders due to the value of the work carried out aboard coupled with the poor system security of Nyx. A well visited Free Trade Union space station where a large amount of the independent trade outside of Brinkburn is done, consisting of extensive facilities built into and away from the surface of one of the larger moons of Erebus. A superneptune massing over 19 Earths, Euthenia is one of the few planets still commonly called it's original survey designation. Too cold, heavy, and distant from inhabited Nyx to be of much interest, some local ship owners still eke out a profit scooping its upper atmosphere for fuel gas.